LAQUAtwin is a series of pocket ION meters. Using Ion Selective Electrode (ISE) technology, they are available for measuring Conductivity, Calcium, Nitrate, Potassium, Sodium, Salt concentration and pH measurement. Using just a tiny amount of sample, the LAQUAtwin proprietary flat sensors can quickly and accurately measure the values of the chemical parameters in the field. A physiological disorder in greenhouse hydroponic sweet pepper (Capsicum annuum L.), where the base of the plant’s stem becomes swollen below the cotyledon level and wounds develop at the base of the stem’s epidermis has been named “Elephant’s Foot”. Sodium is a mineral constantly present in soil, but an excess of it concentrated at the base of the plant stem has been shown to have a correlation with Elephant’s Foot in plants. It is necessary to analyse the conductivity of soil in which hydroponic sweet pepper is grown to consider the extent to which the stem of the plant has accumulated salt. To determine the conductivity of the soil, the Horiba LAQUAtwin Conductivity meter can be used. This is an easy and quick method used to measure the conductivity of soil. A small 5g soil sample is watered down with 20 ml of water. The water and soil mixture is shaken, thus ‘washing’ the soil. This is placed on the sensor of the LAQUAtwin Conductivity meter and the conductivity is measured after one minute. To repeat sampling, wash the sensor with tap water and pat dry with a paper tissue. The use of the Horiba LAQUAtwin Conductivity meter to measure the conductivity of soil will improve farmers’ knowledge of the sodium accumulation and hence choose the best land to grow sweet pepper crops and avoid Elephant’s Foot disorder. 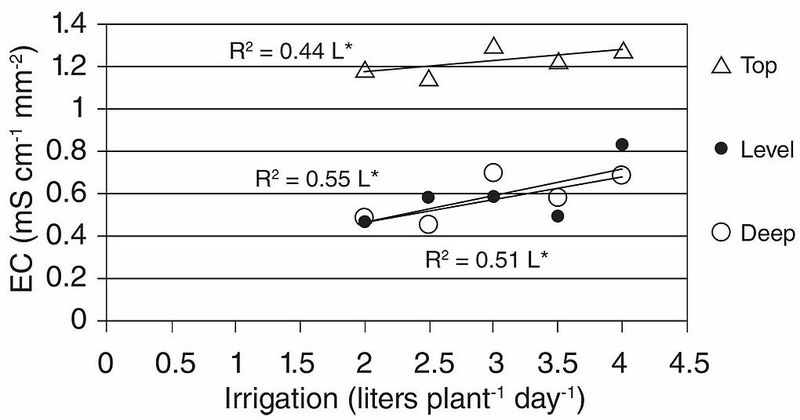 Salt accumulation on the stem base (measured by EC) and volumes of nutrient solution per plant per day at the three transplant depths: “Top”: plants transplanted to half of the container height, “Level”: plants transplanted to the cotyledons level, and “Deep”: plants transplanted to the 2nd node. Electrical conductivity values for each transplant depth and irrigation volume average four soilless media type (coconut coir, peat mix, perlite, and pine bark). L*, linear polynomial effect at 5% level of significance.